The Japan Aerospace Exploration Agency (JAXA) successfully conducted the first phase of the "Drop test for Simplified Evaluation of Non-symmetrically Distributed sonic boom*1" (D-SEND) twice on May 7 and 16, 2011 (Sweden Standard Time) at the Esrange Space Center in Sweden in cooperation with the Swedish Space Corporation (SSC). 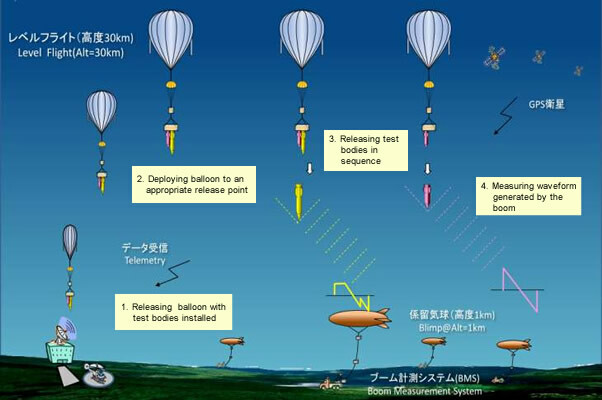 JAXA has, for the first time in the world, confirmed the validity of low sonic boom axisymmetric*2 design by a balloon drop test. Establishing low sonic boom design technology is one of the highest priority issues for realizing silent supersonic transport. As part of silent supersonic research, JAXA is carrying out the two phased D-SEND project to validate its low sonic boom design concept and to contribute to the deliberation of international standards for sonic booms based on the acquired data. In the first phase called D-SEND#1, two different axisymmetric bodies were dropped from a balloon, and the sonic booms, measured both in the air and on the ground, were compared with each other. Through this test, JAXA has successfully demonstrated its low sonic boom axisymmetric design concept technology which reduced the sonic boom by half. The data obtained from the test is valuable as a reference for the validation of the sonic boom propagation analysis method and is expected to contribute to low-sonic boom studies in the future. 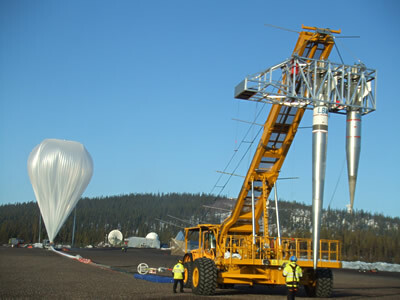 JAXA has also established for the first time a new method of demonstrating the low sonic boom design concept in the form of a balloon drop test. JAXA expresses our sincere gratitude to the Swedish Space Corporation and all parties that provided assistance in this demonstration test. Typical axisymmetric shapes include cone, cylinder, etc. 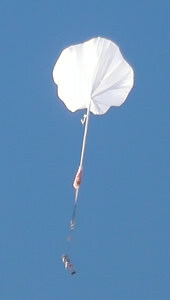 Two test bodies, namely the N-wave model and the low-boom model are dropped consecutively from an altitude of 20-30km. The sonic boom generated by the free-fall is measured by using a low-boom measurement system and a boom measurement system. Pressure metamorphose time records measured by microphones in the air altitude of 500m (Pressure signature) are described below. The characteristic N-type wave was clearly measured by N Wave Model (NWM) in the tests. Meanwhile, the low-boom model validated that its sonic boom could be reduced by comparing NWM. We will further analyze the obtained data and then report the results at a meeting of the SuperSonic Task Group (SSTG) of the International Civil Aviation Organization (ICAO) *3 in November. ICAO is one of the specialized agencies of the United Nations Economic and Social Council, and codifies the treaty, international standard, recommendation and guideline related to international air services to ensure economical and substantial operation of the international air transportation business based on the principle of equal opportunity.